You can read the Privacy Statement: gbantennes.com and additional info about Cookies below. 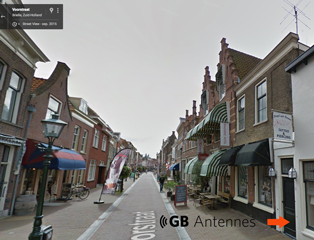 gbantennes.com, located at Voorstraat 47 3231 BE Brielle Nederland, is responsible for the processing of personal data as shown in this privacy statement. Our website and / or service does not intend to collect data about website visitors who are younger than 16 years of age. Unless they have permission from parents or guardians. However, we can not check if a visitor is older than 16. We therefore encourage parents to be involved in the online activities of their children, in order to prevent data about children being collected without parental consent. If you are convinced that we have collected personal information about a minor without this permission, please contact us via info@gbantennes.com, then we will delete this information. - gbantennes.com analyzes your behavior on the website in order to improve the website and to tailor the range of products and services to your preferences. - gbantennes.com follows your surfing behavior on various websites with which we tailor our products and services to your needs. - gbantennes.com also processes personal data if we are legally obliged to do so, such as information that we need for our tax return. gbantennes.com does not store your personal data for longer than is strictly necessary to achieve the purposes for which your data is collected. Personal details: Personalia, Address etc. Retention period: We keep this information as long as necessary and you do not indicate that you want to be deregistered from the web shop system. gbantennes.com does not sell your information to third parties and will only provide this information if this is necessary for the execution of our agreement with you or to comply with a legal obligation. With companies that process your data in our assignment, we conclude a processor agreement to ensure the same level of security and confidentiality of your data. gbantennes.com remains responsible for these processing operations. Cookies are also placed on this website by third parties. These are for example advertisers and / or social media companies. To guarantee the privacy of the client we are discreet in dealing with the personal data of the client. How do we handle the personal data of the client? All data, saved in our database, will be used in the process of excecuting your orders. When needed we may use the data to get in touch with you. We maintain the right to register your IP address. Can I have have insight into my data? You are always entitled to ask for your personal data and if necessary they can be changed or removed from our database. No personal information will be passed on to third parties according to Dutch Privacy Law (WBP). Access to the data is restricted to the administation personel of GB Antennes. What about my rights in the regarding to registration? By means of a written request in which are mentioned your name, address, phone-number ad e-mail address, you are entitled to have access to your registered personal data. If GB Antennes (or third parties) are likely to suffer damages in a disproportionate way, we reserve the right to deny the request. Within one week after receiving your request, we will inform you about our decision by e-mail. Can I have my data removed from the database? • the data turns out to be incorrect. • the registration of the data does not have any value to the purpose of the registration. • the registration of the data is in violation of any statutory regulation. In our webshop we use tiny text files (cookies) which are stored on your computer, tablet or mobile phone. Cookies help us keep track of any products you have added to your shopping basket and to remember you when you come back to look around our site again. To place an order in our webshop we need you to have cookies enabled. However, if you would prefer just to look around our site without buying, you are free to disable cookies. Why are we telling you about our cookies? A new EU law requires us to be open and honest about the cookies we use and should you require any further information please feel free to contact us. To make a purchase in our webshop You will need to accept our cookies as we will be unable to record the products you place in your shopping basket without cookies enabled. If you create an account with us cookies also allow us to remember you when you log in, which makes the buying process a lot easier as you don’t need to fill in all of your details again. However if you would prefer to restrict, block or delete cookies from our webshop you can manage your browser settings as explained. Go to the specific website for more information and follow the procedure. i) When you have already shopped with us and an account has been created, this cookie is used to help us reminding us that you are logd in or not. iii) This cookie is uses to remember all the products that you have added to your shopping cart and is essential when you want to buy the products. This webshop cannot work without this cookie. This cookie informs webshop visitors about cookies and makes it possible for them to turn cookies OFF or ON in their browsers they are using. This cookie is used to look for and share video information with others, to communicate with other people or to make new content.